This is a fun and engaging way for students to practice verb forms or any type of vocabulary. 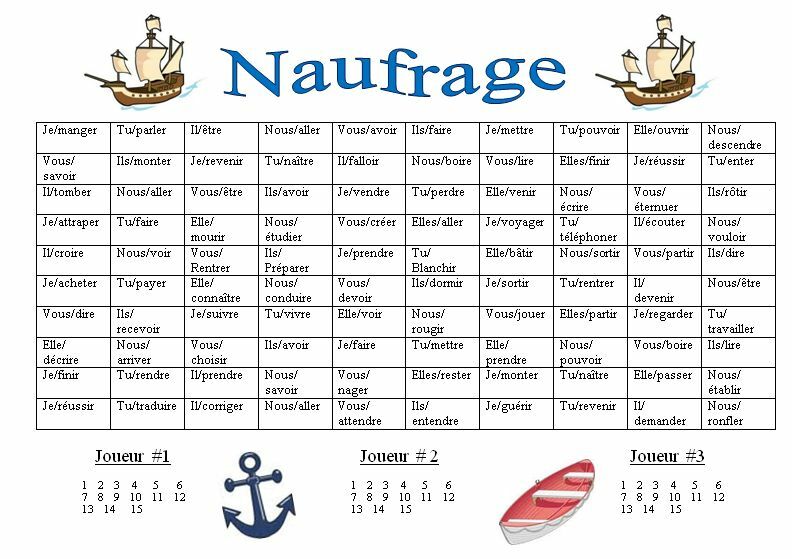 I call this shipwreck (Naufrage, Naufragio, Hǎinàn-海难, Schiffbruch, Naufragium). The board has 1oo squares, you can use fewer or more depending on the level of your students. In the example below there are subjects and infinitives in each box. Students play against an opponent and choose a box. He then says or writes the correct verb form. The example below has the student put the verb in the past tense in French. If the opponent agrees that it is correct, the player gets to color in the square with his color, then it is the opponent’s turn. If the opponent does not agree with the response the teacher is summoned to verify. If the answer is not correct the player loses that turn. When a player gets three boxes in a row of his color he gets a point, which is recorded on the bottom. Each play has a different color and employs a blocking strategy to try to prevent the opponent from getting three boxes in a row. This works well with vocabulary (students either translate or use the word in a sentence) or adjective/adverb forms as well. This entry was posted in Activities and Games, Grammar and Structures, Speaking and tagged activity, game, Speaking, verbs, Writing. Bookmark the permalink.